The issue of "Export review" by the Center for Analysis of Economic Reforms and Communication was submitted for January 2018. This issue includes information on the non-oil sector export in 2017 amounted to $ 1 billion 538 million. As a result, non-oil exports increased by 24 percent in 2017 compared to 2016. During the mentioned period, 1923 subjects participated in export operations. According to the State Customs Committee, most of our non-oil products were exported to Russia in 2017 ($ 553 million). Tomato is the first among the non-oil products exported in 2017 (151.6 million US dollars). The second place was occupied by gold (125.4 million US dollars) and the third place was pure hazelnuts ($ 114.5 million). Generally, exports of fruits and vegetables totaled $ 503 million, aluminum and its products - 118 million, export of plastics and their products - 101 million, export of ferrous metals and their products - 83 million, export of chemical products - 80 million, export of cotton 52 million, export of electricity amounted to $ 51 million, export of sugar - 39 million dollar, tea export - $ 10 million, as well. It should be noted that, export of cotton in 2017 increased by 2.1 times, export of electricity by 80%, export of tobacco and tobacco substitutes by 72%, export of tea by 66%, export of chemical products by 42%, export of fruits and vegetables by 35 %, aluminum and its products by 20 %, export of alcoholic and non-alcoholic beverages by 17 percent, export of plastics and finished products, which increased by 2 percent compared to 2016. In December last year, 457 subjects of non-oil sector realized export operations of $ 151.7 million. Te main commodities exported in December are persimmon, tomato, peeled hazelnuts, gold (not used in coin cutting, other unprocessed forms), apple, methanol (methyl alcohol), etc. In December, the value of persimmon export amounted to $ 20.9 million, tomato - US $ 11.4 million and peeled hazelnuts - US $ 9.9 million. In general, in 2017 the export of tomatoes increased by 61 percent, persimmon by 32 percent, peeled hazelnuts by 9 percent, apple by 30 percent compared to 2016. Compared to 2016, the range of goods exported from Azerbaijan increased by 9 percent in 2017. In the latest issue of "Export Review" the rating of the main exporters from the non-oil sector was given. By non-oil sector in 2017, the following companies like the representative office of the "Azerbaijan International Mining Company Limited" in the Republic of Azerbaijan ($ 83.4 million), Baku Steel Company LLC ($ 60 million) Azerbaijan Sugar Production Association LLC ($ 40.2 million), Sun Food LLC ($ 28.5 million), MKT İstehsalat Kommersiya ($ 27.8 million), Agrodoctor LLC ($ 26.1 million), VN Food Export Import Company LLC ($ 23.8 million), Azagroexport 2017 LLC ($ 23.3 million), Food Export Shamkir LLC ($ 20.2 million) and Ram International Transport & Trade LTD ($ 19.6 million) are in the top ten among non-state companies-exporters. In the list of state-owned companies involved in export operations on non-oil sector, SOCAR's Marketing and Economic Operations Department ($ 155 million), Det-Al Aluminum LLC ($ 103.5 million), Azergold CJSC ($ 77.3 million), Azerenerji OJSC ($ 50 million), SOCAR Methanol LLC ($ 43 million), Food Products Procurement and Supply ($ 32.3 million), Geophysics and Geology Department ($ 3.7 million) ), Azerbaijan Airlines CJSC ($ 1.7 million), Nakhchivan AR State Energy Service ($ 1.2 million) and Surakhani Machine Building Plant OJSC ($ 0.76 million) are in the top ten. Export Review also includes information on service delivery. It was noted that “Azercosmos” OJSC is exporting satellite services to more than 20 countries around the world. According to information from 2017, $ 14 million has been earned from export of satellite telecommunication services (Azerspace-1) and $ 9 million from optical satellite services (Azersky). In total, “Azercosmos” OJSC has exported services of $ 23 million in 2017. The Export Review also provides information about export orders to Azexport.az in 2017. 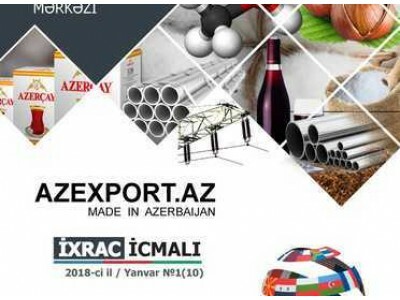 It was stated, that Azexport.az portal received export orders of $ 475 million from 74 countries in 2017. The cost of export orders via Azexport.az in December 2017 amounted to $ 30.4 million. Also, Export Review highlighed information on completion of customs declaration via “One shop stop” Export Support Center, issuance of export incentives for exporters in 2017, state support for local companies to obtain international export certification, buying missions to Azerbaijan, research of the Ministry of Agriculture on export opportunities and other related issues. The purpose of the "Export Review" is to help entrepreneurs to raise awareness on export, increase their ability to export local goods to traditional and new markets, and accelerate the process of integrating international markets. The "Export Review" is available at www.iqtisadiislahat.org in the Reviews section.